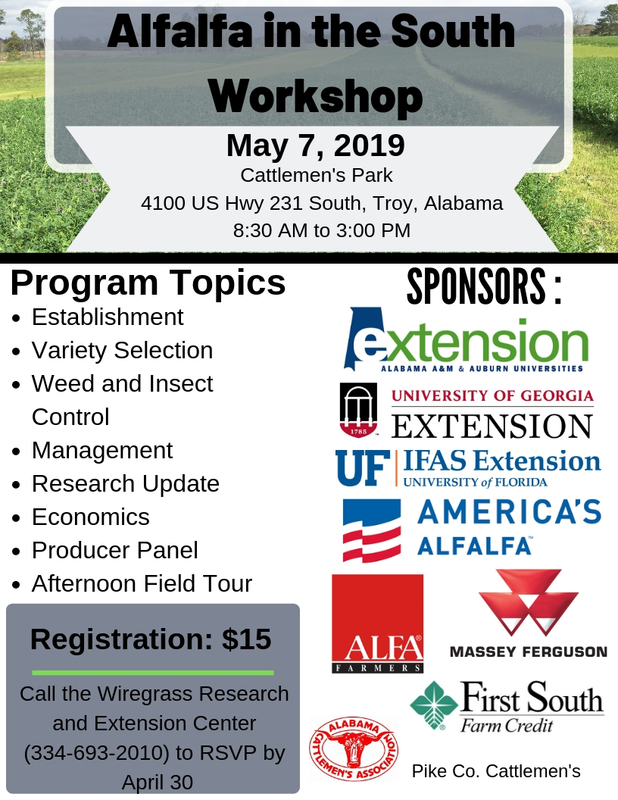 Alabama is hosting the Alfalfa in the South Workshop, which will provide training on how to get started with incorporating alfalfa into bermudagrass hay fields. This workshop is part of a grant in cooperation the University of Georgia (UGA) and University of Florida (UF). While hosted locally in Pike county, this is a Southeastern US regional event with speakers from UGA, UF and Auburn University on the program. This workshop is scheduled for 8:30 AM – 3:00 PM Central, on Tuesday, May 7, 2019. The morning session will feature lessons on alfalfa establishment, variety selection, pests control, management, research updates, economics and a producer panel at the Pike County Cattlemen’s Park (4100 US Hwy. 231 S., Troy, AL). Following lunch, the afternoon session moves to Mr. Steve Stroud’s poultry and hay farm near Goshen, AL for a field tour and demonstration of a newly established alfalfa stand. There is a $15 registration cost to cover workshop expenses. This should be paid (cash or check) on site at the registration check-in. Interested clientele are asked to RSVP for the workshop by calling Ms. Carllee Solomon – 334-693-2010, at the Wiregrass Research & Extension Center by April 30th. This will help organizers to prepare an adequate number of handouts for participants and provides a proper meal count for lunch. Please let me know, if you have any questions regarding this event.